Thirteen years have past since Otocinclus were featured in this spot. This situation has now been ably addressed by Mike Norén, who introduces a favourite Otocinclus of his. Peppered Otos are one of the largest species of Otocinclus, reaching about 55 millimeters in total length. They're a temperate species from the lower parts of the Rio Paraguay/Paraná, Rio Uruguay and La Plata basins. In summer water temperature is typically 24 - 27 degrees Celsius, while in winter it may even briefly freeze. They're not demanding with regards to water parameters, but in their home waters the pH ranges from 6 to 7.5, with a conductivity in the range 60 - 150 µS/cm, depending on locality. Like all otos they're schooling fish and benefit from being kept in groups, but in addition to that it is an imitator. Otos have little in the way of natural defences, so a few species have evolved to look and behave like other, more dangerous, fish. The Peppered Oto imitates the familiar Peppered Cory, Corydoras paleatus, a species armed with poisonous spines. Can you instantly tell which are harmless Otos and which are poisonous Corys? Neither can predators, and that seconds hesitation may be all the Oto needs. It is unclear what the Corys get from the arrangement, but at the very least there are more eyes to watch for predators - and more bodies to hide among if a predator attacks. When kept together Peppered Corys and Peppered Otos will school together. The Corys appear to be fooled by the Otos imitation, following them around, gulping air when the Otos do, even trying to mate with them, but the Otos clearly know who's who. Probably because it is an "impostor" the Peppered Oto seems more social and has better developed dominance/submission behaviors than other Otos I've kept. It could be an interesting project to study things like the subtle difference in how they interact with each other and how they interact with the Corys, and whether the bright white ocular diverticulum (the little "nubbin" at the edge of the pupil) helps them tell imitator from imitee? Peppered Otos can be kept without Peppered Corys, but my experience is that this normally active and outgoing species then become quite shy. They clearly feel much safer in the company of Corys. Because this is a schooling, active, species, I'd recommend a fair-sized aquarium, say 80 liters (21 gallons) and preferably bigger, and keeping them in a group of at least five, plus five or more Peppered Corys. They have no particular demands on water, but the aquarium should have both densely planted areas and open sandy areas. They can be a bit tricky to get to start eating, but once you get them to eat they're hardy fish who'll eat pretty much any food you give them - although high-protein food may be bad for them. Like with most Otos they will not eat vegetables until they start to decompose, so you may have to leave those slices of zucchini or brussel sprouts in the water for a few days. In terms of mixing with other species, they're peaceful and can be kept with small fish, but should not be kept with aggressive or predatory fish. In older literature it states that Peppered Otos are easy to breed. This is not actually true, and is due to an earlier confusion with species of Parotocinclus. The real Peppered Oto has been spawned in aquaria at least once, but it was an accidental breeding so it's hard to say what triggered spawning - although that there were breeding Corydoras present may well be a factor! An aquarist in Argentina told me that Peppered Otos there breed in spring among water vegetation when water temperature reaches 14 Celsius, but overwintering my Otos in cold conditions (4 Celsius) and slowly raising temperature did not lead to spawning, so temperature may not be the trigger. They probably follow the normal Oto pattern, depositing eggs singly or in groups on broad-leaved plants or the glass walls, and not guarding the eggs. This is an active, peaceful, and hardy fish, one of the prettiest of all Otocinclus, and with an interesting symbiotic relationships with Peppered Corys - what more could you want? Type Locality Rio Jacuhy [Jacuí], Rio Grande do Sul, Brazil. Etymology Greek, ous, oto = ear + Latin, cinclus = latticework; in allusion to the holes of the head in the ears. Size 54mm or 2.1" SL. Find near, nearer or same sized spp. Identification An easy species of Otocinclus to identify although two colour forms exist. One with a more pronouced darker and lighter "peppering" and one with a more regular pattern. 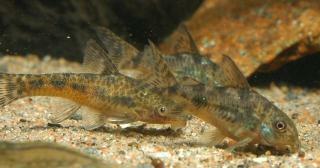 This variance aside, the colouration is the same as the common peppered Cory, Corydoras paleatus. Coloration of individual otos vary with mood. Normal coloration is beige with spots, but this species (in presumed breeding mode) turn darker, and may become almost black. Other species of Otocinclus which can have a blotched color pattern are O. arnoldi, O. mimulus, and O. xakriaba. O. flexilis is distinguished from O. arnoldi and O. mimulus by having six branched pectoral-fin rays (vs. five branched rays in O. arnoldi and O. mimulus). O. flexilis is distinguished from O. xakriaba by the presence of a triangular pigment mark at the dorsal-fin base of O. flexilis (absent on O. xakriaba). Sexing Females are considerably larger than males and fuller in girth. Distribution South America: Middle and lower Paraná/Paraguay, Uruguay and La Plata basins and Atlantic coastal streams of southeastern Brazil. Feeding New imports can be tricky to acclimatize to prepared foods, but once this hurdle is overcome (using frozen bloodworm and algae wafers) they feed greedily. Furniture Less reliant on plants than other Otocinclus species, nevertheless, tall leaved plants like Vallisneria provide habitat and shade for these species that also appreciate vertical wood surfaces but generally move around the aquarium without preference. Gravel or sand may be used. Compatibility A highly social, diurnal and hardy species. Slightly aggressive (more akin to slightly larger loricariids); they defend food albiet half-heartedly, and dominate Corydoras at feeding time but not to the other species detriment. 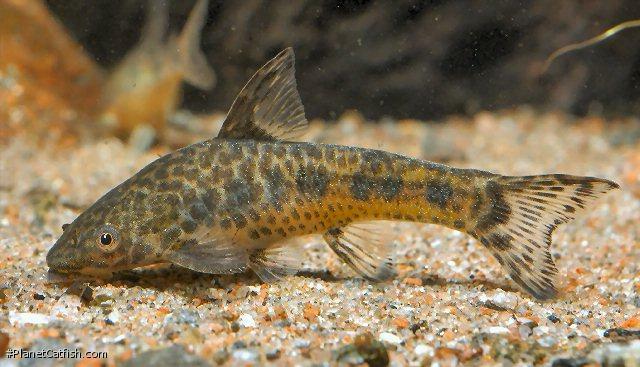 Also when kept with Corydoras paleatus, the Corys appear fooled by the oto mimics, and often follow them around, gulp air at the same time the otos do, and even male corys display to otos. The otos on the other hand seem aware which fish are conspecifics, as they're noticeably more aggressive towards the corys than to each other. Perhaps the bright white opercular diverticulum serves as a recognition signal for the otos? They have a curious behaviour that they nibble at each other and corys at the base of the dorsal fin, something which is apparently very unpleasant for the receiving fish - it looks like aggressive/dominance behaviour. Suggested Tankmates Keep in groups (preferably at least six) with any small to mid-sized community fish. Breeding It is reported that smaller male fish 'dance' in front of larger fish, 'nudge' the larger fish in the region of the cloaca, and also follow them around very closely. Actual reproduction is unreported. There are 6 registered keepers, view all "my cats" data.